My response to each of them–every rhetorical question deserves a response– was, “We Dat.” If the Saints are a metaphor for a resurgent New Orleans, it is because they epitomize what has lifted our region over the past four years: a remarkably broad and committed effort, where every day brings a different savior, a different star. In this game it was the sensational Sharper; last game it was the unheralded Garrett Hartley and his game-winning field goal. 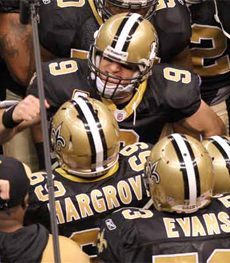 The point is, the Saints are clearly a team of “we”; it is their collective talent and selflessness that has taken them from well-documented lows to celebrated new heights. This is why everyone, from presidents to residents, loves the Saints. They are a team of “we”–and so is our region. Growth of new companies like the Receivables Exchange, iSeatz, TurboSquid and Naked Pizza that are led by fearless entrepreneurs who have made our region their home base for global expansion and prompted FastCompany to name New Orleans one of the “fastest” regions in the U.S.
Go Saints. Go New Orleans.